The Dairy Farm Road plot's most attractive attributes are its proximity to the Bukit Timah Nature Reserve and partial unblocked views over the landed residential plots. A 99-YEAR leasehold site at Dairy Farm Road, launched on Thursday under the Confirmed List of the government land sales (GLS) programme, is expected to see keen interest from developers, market watchers say. 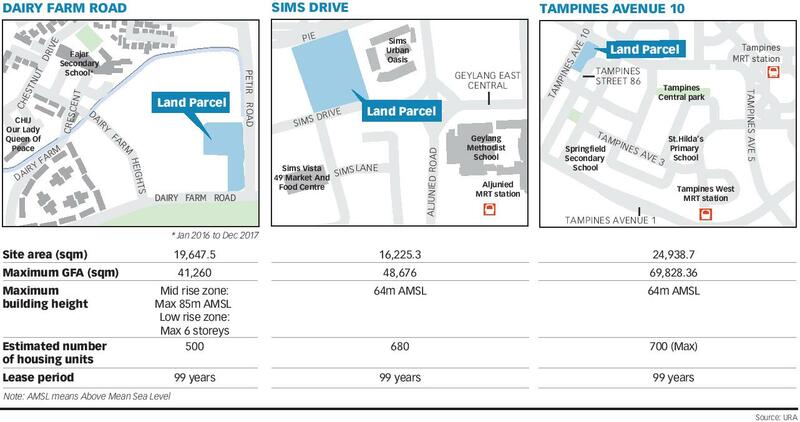 There are also strong prospects for the two Reserve List sites - one at Sims Drive and the other at Tampines Avenue 10 - to be triggered for sale, they add. This is especially so for the executive condominium (EC) site in Tampines, given the depleting stock of new ECs for sale and the continued appeal of the hybrid public-private housing product among homebuyers. Collectively, these three sites can yield some 1,880 residential units. Sites on the Confirmed List of the GLS programme are launched on schedule while sites on the Reserve List that become available for application are triggered for sale only when there is a minimum acceptable bid. "All three land parcels should find favour with developers given the improved market sentiment and good absorption of new supply," said Colliers International head of research for Singapore, Tricia Song. "The launches year-to-date have met with good take-up rates and should further bolster developers' confidence to bid for sites." JLL Singapore head of research and consultancy Tay Huey Ying posited that the Confirmed List site at Dairy Farm Road could even set a benchmark price for GLS land parcels in the Dairy Farm/Bukit Panjang/Hillview/Bukit Batok locality. The site's proximity to Hillview MRT station and major expressways as well as strong rental demand from expatriates in the locality are reasons why the site may prove to be popular with developers, she said. The last time a residential GLS site was sold in the area was in 2012, to a consortium led by TA Corporation for S$616 per square foot per plot ratio (psf ppr) and developed into The Skywoods. In the vicinity, The Dairy Farm is now in the process of gathering the requisite consensus for its collective sale with an asking price of over S$1.68 billion, or a land rate of at least S$1,100 psf ppr inclusive of the development charge. The current record GLS land rate (S$805 psf ppr) in the Bukit Panjang/Hillview/Dairy Farm/Bukit Batok locality is now held by the land parcel where Hillion Residences and Hillion Mall stand. Units in Hillion Residences have commanded average prices of S$1,496 psf this year, Ms Tay noted. Huttons Asia head of research Lee Sze Teck felt that positive market sentiment, developers' interest to replenish land bank, the lack of new supply in the area and other good locational attributes will all contribute to keen interest for the GLS site at Dairy Farm Road. "It may attract up to 10 bidders and a top bid of between S$900 and S$1,000 per square foot per plot ratio (psf ppr)," he said. The Dairy Farm Road plot, which can yield some 500 units, is zoned residential with commercial on the first floor, with a cap of 4,000 sq m for commercial uses. At least 500 sq m of gross floor area has to be set aside for a childcare centre. With prior written approval, a combination of flats with strata landed houses is allowed. "Setting aside some commercial use to support the growing residential population is timely," said Ms Song, who expects the top bid at S$880-950 psf ppr. "The site's most attractive attributes are its proximity to the Bukit Timah Nature Reserve and partial unblocked views over the landed residential plots." Meanwhile, developers are hungry for EC sites, as reflected in the 17 bids and record-breaking top bid for the Sumang Walk EC GLS site when its tender closed in February. Should the EC site at Tampines Avenue 10 on the Reserve List be triggered for sale, it is also likely to draw stiff competition from developers, consultants say. It could potentially fetch S$360 million (or S$480 psf ppr), Ms Song said. "This would be lower than the record psf price of S$583 psf ppr for the Sumang Walk EC recently, but will still be the second highest for an EC site." Mr Lee of Huttons Asia is more bullish, expecting a top bid of up to S$600 psf ppr for the EC site, potentially beating the top bid for the Sumang Walk site tabled by City Developments Ltd and TID. Similarly, if the Reserve List site at Sims Drive is triggered for sale, consultants expect it to draw a top bid of up to S$1,200 psf ppr, significantly higher than the S$687.9 psf ppr for the Sims Urban Oasis site acquired by GuocoLand in 2014. Under the Master Plan 2014, it is the last parcel of land zoned for residential development along Sims Avenue, Mr Lee said.